General view of the Ulster White Limestone Formation in Clarehill Quarry, Moira, Co.Down, exposing the succession from the Garron Chalk Member to the Tanderagee Chalk Member. 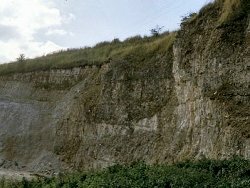 The sequence at Clarehill Quarry is representative of the attenuated Ulster White Limestone Formation in the Lagan Valley. The quarry contains well preserved paramoudra from the Ballymagarry Chalk Member. Clarehill Quarry is 600m SE of Moira, Co. Down. In this area the Triassic sediments are unconformably overlain by the Ulster White Limestone Formation which is also unconformably overlain by Palaeogene basalts. The term paramoudra was first introduced from this district by Buckland (1817) and is a corruption of an Irish name, probably padhramoudras `ugly Paddies' or peura muireach `sea pears'. The area was mapped and an explanatory memoir produced by Hull et al. (1871). The site was referred to by Tate (1865) and Hume (1897). More recent studies have been by Manning et al. (1970) and Fletcher (1977). In the quarry all members of the Ulster White Limestone Formation from the Garron Chalk Member to the Tanderagee Chalk Member are exposed. The Garron Chalk Member, 0.9m thick, consists of highly glauconitic chalk with a few phosphatised quartz pebbles and glauconite stained and unaltered fragments of Mercia Mudstone. The Portrush Chalk Member is 2.7m thick. The lower part of the member is characterised by glauconite stained intraformational erosion surfaces with associated bioturbation, termed the South Antrim Hardgrounds, and is flint free. Above these the chalk is bedded with flint nodules. A little glauconite is present in the base and the fauna is comparatively rich. The top of the member is drawn at a poorly developed bedding plane immediately below the lowest paramoudra. The Ballymagarry Chalk Member, previously described as the Paramoudra Beds is 13m thick and is characterised by a large increase in the amount of flint with massive nodules and nodular zones and with numerous paramoudras, large barrel-shaped flints. Paramoudra in the Ballymagarry Chalk Member at Clarehill Quarry. The top of the member is marked by a prominent and laterally continuous bedding plane, below which Inoceramus debris is very abundant. 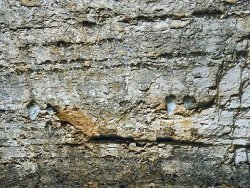 The Tanderagee Chalk Member, 3.4m thick, is very fossiliferous and is characterised by slabby rather than massive chalk with courses of tabulate flints, which exhibit complex silicification phenomena. The Clarehill Quarry provides excellent outcrop of the upper part of the Ulster White Limestone Formation and is representative of the sequences developed over the Lagan Valley positive area. In particular, the paramoudras are well developed in this quarry in the area from where they were first described. The site is of national importance, not least because of its historical importance and should be conserved. The hardgrounds demonstrate that sedimentation of the Portrush Chalk Member was in comparatively shallow-water conditions with reduced, and at times, arrested sedimentation. This member contains hexactinellid sponges and a rich fauna of aragonite- shelled molluscs preserved as moulds and steinkerns coated with a green skin of glauconite. The paramoudras were originally thought to be sponges (Poterion cretaceum) but they are now regarded to be of inorganic origin. The sequence exposed in Clarehill Quarry demonstrates the importance of the Lagan Valley positive area during chalk sedimentation. The sequence is much condensed and the lowest 8 members of the Ulster White Limestone Formation are not developed here. To the NW the younger members of the formation occur although the thickest sequences are not encountered before the Larne-Lough Neagh Basin, north of the Knockagh Axis. The exposures in Clarehill Quarry have attracted much attention. Particularly well exposed are the paramoudras of the Ballymagarry Chalk Member of the Ulster White Limestone Formation. The sequence is attenuated due to the influence of the positive Lagan Valley during sedimentation. The site should be conserved because of the historical interest in the paramoudras. For general information on the Cretaceous System in N. Ireland see Key Site 1194 - The Cretaceous System in N. Ireland - Introduction. For information on other Cretaceous sites see Key Site 1207 - White Rocks - Cretaceous, Key Site 1208 - White Park Bay, Key Site 1209 - Dunnaglea-Larry Bane Bay, Key Site 1210 - Port Calliagh-Ballycastle, Key Site 1211 - Capecastle Quarry, Key Site 1212 - Garron Point-Cloghastucan, Key Site 1213 - Glenarm Quarry, Key Site 1214 - Creggan Quarry, Key Site 1215 - Portmuck, Island Magee, Key Site 1216 - White Head, Key Site 1218 - Kilcoan, Island Magee. Approach: 600m SE of Moira. Access to the site is along a track from Clarehill Road. Threats: Use as a landfill site.